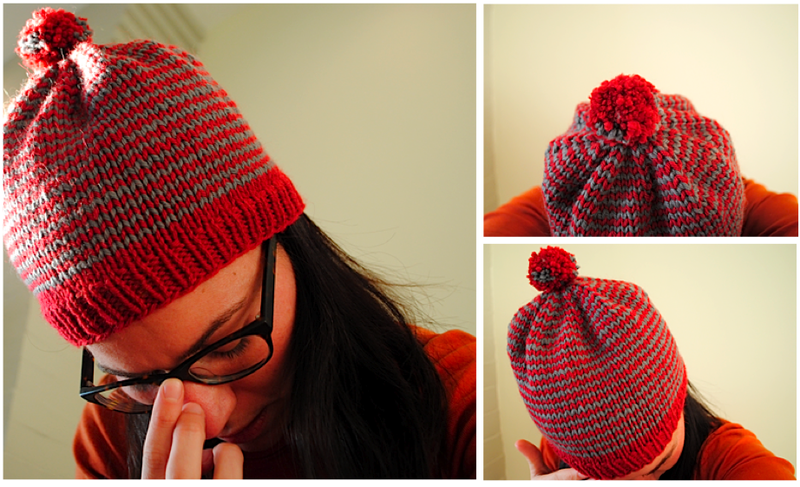 More in the illustrious 2011 striped knit frenzy; this is a basic red and gray striped hat I quickly knitted up in a few hours as a gift for a friend but fell madly in love and so made him a different one so I could keep this. I usually make things with friends in mind; it was really satisfying to keep something for myself. Since then, I’ve played off this original and done a few other ones; one with larger stripes, one with a bigger pom. Addicted, for sure, and shots of those coming, as well. As always, more snaps of the R&G stripes at the hat flickr set. thank you so much! you should make one! instant gratification.